I have broken the piggy bank for a brand new S5. I'm a 3D Printing Service provider. If I set up my print in Cura using for example Ultimaker Tough PLA Black and not using the NFC to detect the spool when loading the material (I use dry boxes), the material is then PLA Unknown in the S5. I send the job to Cura Connect, it is assigned to my S5, but I need to override the configuration and confirm. Then the job starts but quits within a minute and goes to the history. If I load the filament using the NFC, the job will start at once. I have two Ultimaker 3, and the same scenario works fine. I print mostly with non Ultimaker spools on them since a year now without any flaw. Is it a bug in the firmware? In that case, I've bought a 6K professional printer that standing in my office not working. Is it a new feature of the Ultimaker ecosystem? In that case, the printer will return directly to the distributor and I'll go for a Stacker S4 even if it's 1.75 filament unlike all my other printers. I have no problems at all to load other brands than UM spools. When loading a spool, I have to select the material, for example, PLA and then I have to select Generic PLA in Cura - works fine. If I choose in Cura UM PLA then I get the message that I can override. I never tried to override it, because I always select the correct material in Cura. So I don't know if it is a bug when you override and the print aborts. But the normal way works fine. The important step is, that you have to choose the correct material in Cura. So choose the Generic ToughPLA and not the UM ToughPLA in Cura and it will work. The UM profiles and the generic profiles have the same settings, so don't worry about that. I am using Cura + Cura Connect + UM3E for a year now, without any issues with other filaments than Ultimaker, doing the same procedure as the one you've described. I print nearly 24/7 with the UM3E. But with the S5 unboxed from this morning, it is not working. 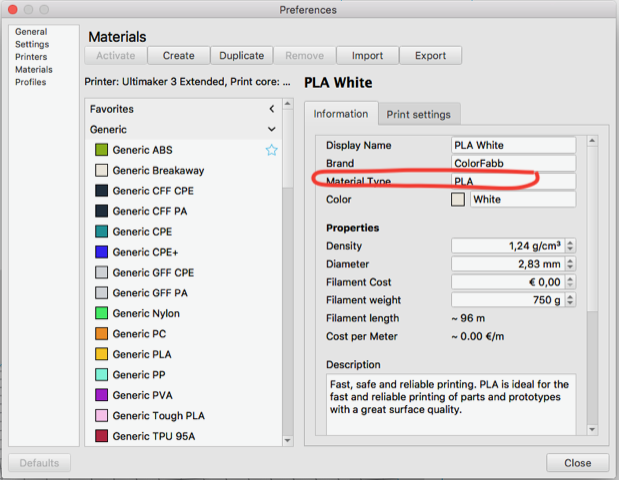 If you set up a job in Cura using for example a ColorFabb PLA derived from the Generic PLA material and load a PLA in the UM3 without using the NFC, then the material in the UM3 will be displayed as Unknown PLA. Sending the job to Cura Connect, assigned to the UM3, it will go to the right queue. 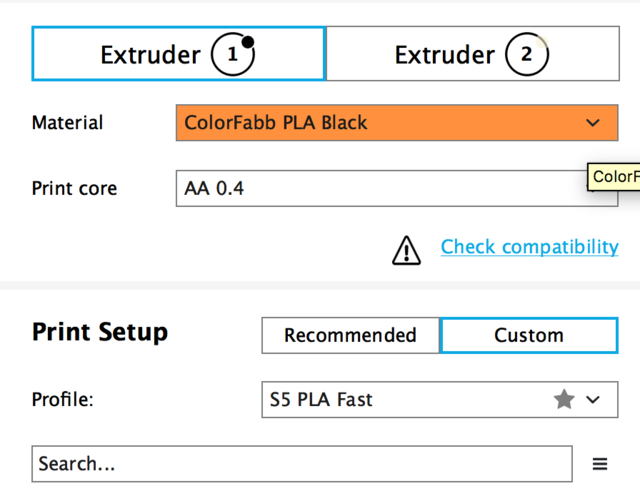 A warning will be raised asking if you want to modify the configuration in order to use the ColorFabb PLA instead of the Unknown PLA (or a message similar, don't remember the exact wording). If you agree, then you'll have to acknowledge the change and the prints starts. With the S5, it's the same scenario, but after starting the job, it is terminated within a minute, without doing anything and the job is archived in the history. Ok, so you have the printers in a Cura Connect group, right? That could be the reason why I don't get this failure, I don't have my printers in a group, I send the jobs directly to the UM3 or S5 and then it is working even without a warning message and the printers start immediately. I had to reconfigure Cura Connect with the S5 grioup host and the two UM3 part of it, after resetting all printers’ queue. The issue is only on the S5. The two UM3 are behaving like before. I have tried to print a dual extrusion job, using PVA. But I put the PVA Spool in the dry box, just put the Tough PLA spool on the NFC. I've got the warning as the PVA Is recognized as generic in the S5. I've replaced the configuration and acknowledged, the job started without issues. So is the problem linked to the main material not using NFC ? I dit have the same problem with my S5 at the start, meanly when I tried to send prints over wifi. I have newer gotten the wifi to work. So now its on a cable and i don't have any problmes. I don't know have the problem sould be related, but after instaling the cable its gone. Maby it was just a coincidence! I use LAN / cable connection from the start as wifi is not reliable and with lower speed than LAN Connection. The other point is for cost reasons, I don't use that much Ultimaker filament : too expensive for PLA / ABS / PETG / ASA / Nylon then renowned brands on the market (ColorFabb, Polymaker, FormFutura, Taulman, ...). Quality is very good, but the third parties are also very good. As the S5 is commercialized as compliant with third party materials, using the Generic profile or derived from generic, it should work. I need to do some more tests tomorrow morning, as I had a print working this afternoon with the material 2 non NFC (tough is was Ultimaker PVA) and material 1 NFC recognized. Yes, this is normal or in other words, the UM material will be detected via the NFC tag only if the spool is on the reel holder. If you put your UM PVA in a dry box, then you have to select generic PVA in Cura and you will not get a warning message. UM PVA profile and the generic PVA profile are identical so don't worry about different settings. So select in Cura UM materials only if the spool is on the NFC reel holder and the printer has detected the material itself. 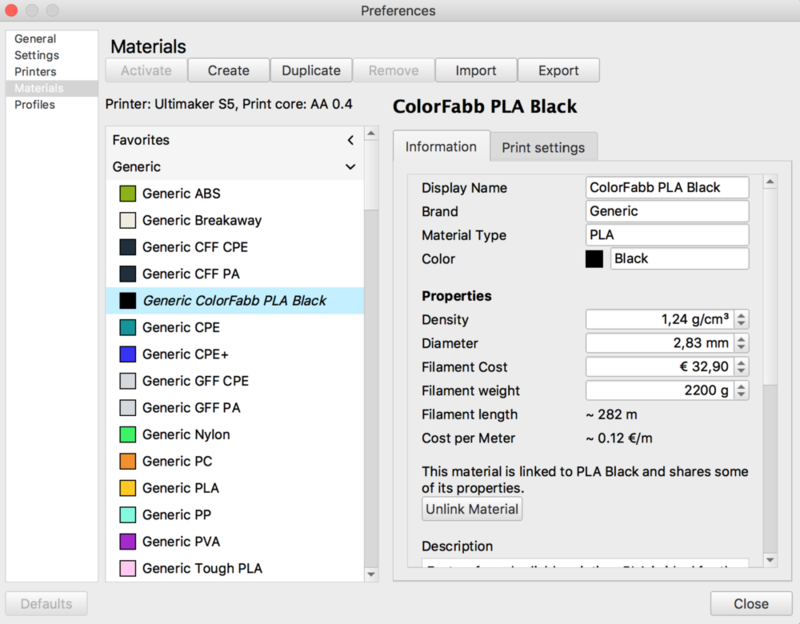 If you have to select the material manually at the printer you have to select the generic profiles in Cura. Another example, I have one spool UM PLA Black which has a NFC tag, but could not be detected by the printer. 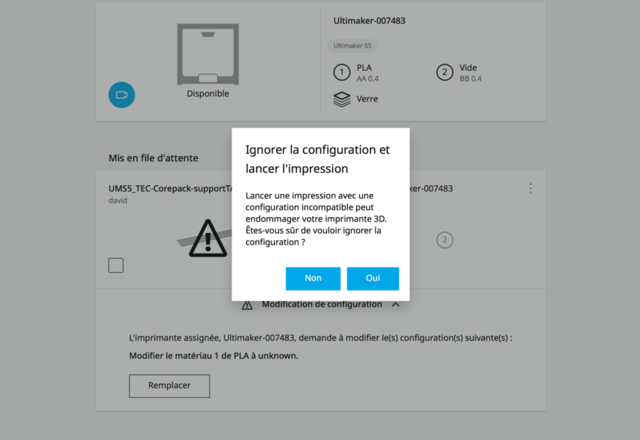 So I have to select manually PLA from the selection on the printer and have to use generic PLA in Cura, otherwise, I would get the warning message. This is possible, but not necessary. You win nothing with it, except that you don't have to select the material from the list. For the printer, it doesn't matter if you select PLA from the list or the printer detects UM PLA itself via NFC chip. Thanks Smithy for reformulating your previous post. I'm pretty used to Cura / Cura Connect as I operate 2 Ultimaker 3 Extended for a year now with Cura Connect. 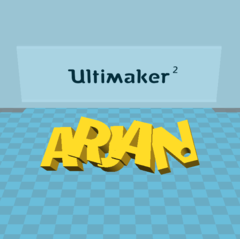 I have created profiles in Cura derived from the generic profiles. See pic. When I load the material on my UM3, I just select the PLA on the UM3. Sending the job to Cura Connect, it will be pending until you change the configuration as prompted in the warning message in Cura Connect. Then you confirm the change et voila ! The print starts. If I want to do the same with my S5, in the last step, I confirm the change, the print starts and then aborts within 30 seconds. But if I take the same material configuration, change the printer in Cura to UM3E, using the same Cura Connect, it works fine. So I thought you have selected UM PVA in Cura and you are wondering why this message is shown. If I have time over the weekend I will try to create a Cura Connect group and put my UM3 and the S5 in the group. If it is a bug with the S5 I should get the same issues. But another question: Why do you use a group mixed with UM3 and S5? I also thought about to do it, but I am not sure if I have any advantage over just using each printer alone. So is it easier to handle for you? I haven't tried reconfiguring the printers in order to recreate my UM3 group and an S5 group, maybe it will work. But I need to have all my printer available and reboot them / reset cura connect. - same through a browser. - you have some very cool features in Cura Connect when the server is the S5 : reprint a job already done without having to re slice in Cura. 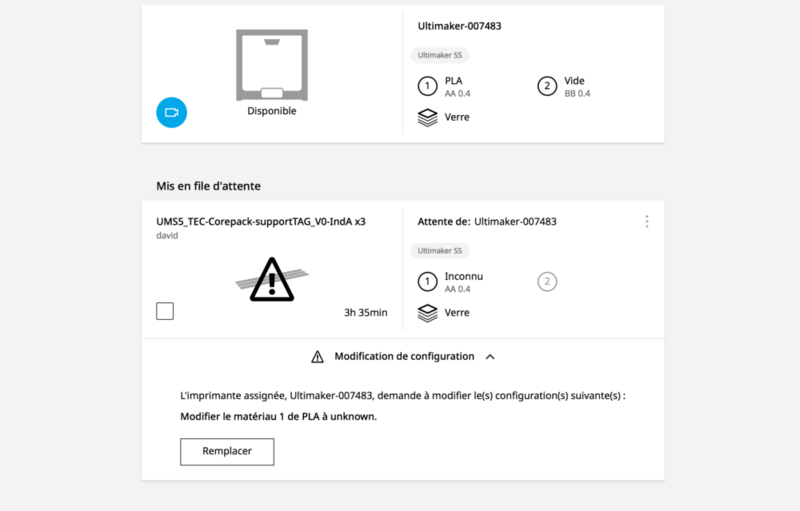 By the way, the only way to have S5 and UM3 in the same Cura Connect Group is to set the S5 Group Host.. Tomorrow I will try to print a job using only generic material, as I rebooted the S5 this morning and the fact I managed to print a job with material 2 non NFC may be a good clue. Thanks for the information, I think I should try the group feature and see if there are any benefits for me. Basically I can do all the things now too, but I have to switch in the app the printer or select the printer via web directly. I read that you have to recreate the group each time you do a Cura Reset on your printer and due the fact that I have to do that every few days on my UM3 I never tried it. But maybe with the S5 as the host/master I don't need the resets anymore. I have first rebooted my S5, but not resetted the Cura Connect. I have loading the filament in the S5, without any NFC, but I picked the PLA option when the printer said filament was not detected. Then the job started on the printer and terminated 30 seconds after and went to the history as done. So I am unable to print any third party material nor Ultimaker material without NFC. So I bought a printer that prints only the manufacturer material though is it stated in the tech specs that it's compliant with third party material. For a 6K professional grade printer it is a serious issue and I may reconsider my purchase. I am sorry to say, but this is not completely correct. There is maybe a bug with the Cura Connect group functionality, but it is not true that you are not able to print none Ultimaker materials with your printer. 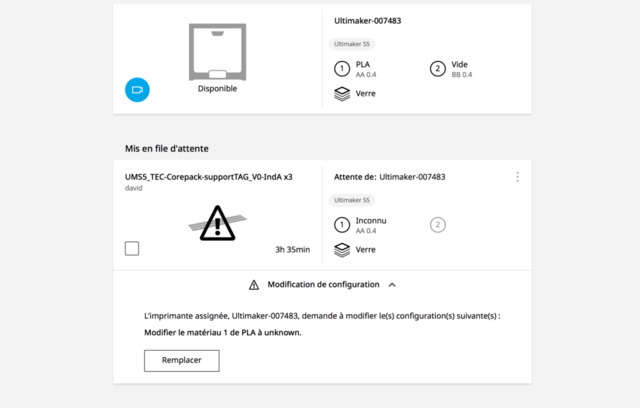 You are not able to print via Cura Connect group, but if you send the job directly to the printer via the network, without a group, then it will work because of that's the way I print with my S5 with none UM materials. Disable extruder 2 if you don't use it and see if there is any difference. Maybe the orange warning comes from your configured material diameter, you set it to 2.83 instead of 2.85. But I have tried it here in my Cura and there is still no warning, so I guess it comes from your custom profile. I've bought a package hardware and software. As advertised, the S5 should work with Cura Connect, not connecting directly to the printer. Regarding the warning, I have also noticed it, but it works fine on the UM3 in the same Cura Connect group. I'm may reinstall from scratch Cura purging all the preferences, materials and profiles. But first I'll do the test with the default Fast profile. BTW, if all the spools must have 2,85mm diameter to comply with Cura and Ultimaker environnement, there is more than a bug, it's a design flaw. It's very similar to my issue. Except I have the problem in Cura Connect queue. And the problem is only with the S5. No issues with UM3 in the same Cura Connect Group. Huh? Bowden tubes, nozzles, the whole hotend, almost everything has to be matched to a specific filament diameter. For most printers that's 1,75mm, for others (mainly Ultimaker, these days) it is 2,85mm. I can see neither a bug nor a design flaw in this regard. Cura, on the other hand, doesn't have any problems with diameters other than 2,85mm. Huh? Bowden tubes, nozzles, the whole hotend, almost everything has to be matched to a specific filament diameter. For most printers that's 1,75mm, for others (mainly Ultimaker, these days) it is 2,85mm. I agree on that. I was too quick. it’s part of the manufacturing process. So the filaments diameter has to be adjusted to the real one for fine tuning purpose. Cura supports that feature, like S3D or any slicer. So it is not the reason why I cannot override the material nor why I have a warning. I've done some more testing. Having that said, I have recreated from the Generic PLA my ColorFabb, changed my filament, going to a ColorFabb Black PLA and loading it with the PLA profile non NFC. I made a first test using the default Fast profile, sent to Cura Connect, and the job had been assigned to the S5 and print has started. Then I took my custom profile and sent it to Cura Connect and the job had been assigned to the S5 and print has started. I took an old ColorFabb PLA Black created months ago and used on my UM3 without any issues. The job had been assigned to the S5 and then I had the warning message in Cura Connect and the issue when overriding the material. 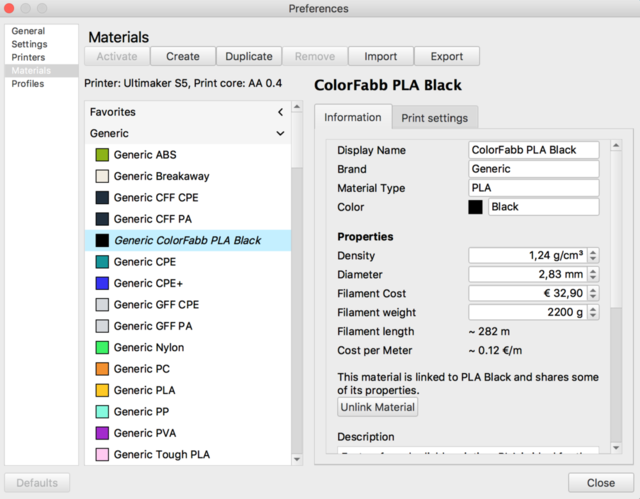 So I agree that the S5 and its environnement is able to print third party materials. But there is a bug in Cura Connect, affecting only the S5 when overriding the materials. And my Cura 3.6 is somewhere corrupted. I will re install from scratch Cura on my Mac, time to write down all my profiles and materials. How I print with Non UM filaments. I choose PLA. Set my desired temps and other stuff. Send through Cura Connect. Tell it to override. Easy peasy, Printer squeezy. As for all the latest foo fufarahs, I just let it settle out a version or two. Today's software in general, too fast on release, too buggy. This goes for the entire tech industry. Basically, all users are beta testers it seems. At least Team UM does not force it on you like MSoft does. Edit: And I have not used a printer profile in almost 18 months because of this stuff happening.